On the afternoon of March 1st, the third show of the Chinese Spectacular in Tainan attracted many physical fitness professionals. Feng Su-chu is a standing member of the Taiwan Health and Exercise Association. She said that the songs were very poignant and the lyrics had very deep meaning. "I believe that God was with us. The vocal solo performance was very touching." Ms. Feng said that she could feel compassion in every number. "Though the performers didn't speak, their message was vividly presented through gentle movements and their unique bearing, and it penetrated into every cell of the audience members." A group of fitness professionals was interviewed after the show. Among them, Ms. Li said that she came with her husband and more than 10 friends and relatives. She said that the "Decent of the Celestial Kings" was so powerful that she sensed the wonder and magnificence of the Heavens. "I felt that I was invited to be part of it, and I was just touched." 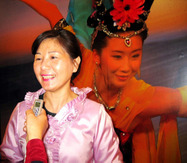 Ms. Lu said that the songs were very touching and the lyrics conveyed great compassion. "I felt a warm current move through me. It was so wonderful."